As we enter July, one of the hottest months in Indiana, I know for me personally I’m always craving a cold drink. I try my hardest to stay away for pop and other high sugary drinks. One way that I’ve kept my promise to myself to keep this a pop free summer is to add Kombucha into my diet. The fizzy carbonation mixed with an assortment of different types of flavors is a healthy beautiful replacement. There are even a local Indianapolis company I love to show support to when buying kombucha. Not familiar with kombucha? Although kombucha is new to western culture it has been used in China since 200 BC. Kombucha is a fermented tea that is infused with millions of probiotic strains. It is made from tea, sugar, a scoby, and natural flavoring. A scoby is short for, Symbiotic Colony of Bacteria and Yeast. The scoby makes the magic happen in creating this health boosting tonic. I’d suggest clicking here to watching on how the magic works. Kombucha offers a plethora of health benefits: immunity support, energy boost, ease joint pain. It provides the body a millions of probiotic strains aiding in detox and digestive functions. Personally I like to follow ayurvedic practices with this drink. I drink kombucha first thing in the morning. Although kombucha is always blessing your body, is most effective on an empty stomach. I also enjoy using it to reset my body and provide extra healthy probiotics after a weekend of eating out or drinking too much craft beer. Circle City Kombucha started out as a hobby of 3 friends in 2014. Each founder graduated from business school at Arizona State and a few years later all found themselves in Indianapolis. Matt Whiteside and Freddy Ferro offered a background in brewing. While Skylar Williams offered a background in kombucha. He is a native of Oregon, which is the kombucha Mecca of the USA. These 3 together started creating kombucha in local commercial kitchens making it for their friends and family. As their craft began to blossom so did their ideas and branding on their fizzy nectar. They worked to create a drink that was a healthy substitute of soda with 3 dynamic factors. These ideals included creating a drink that is refreshing for the midwesterners pallet, health benefiting, and affordable. It all began to alchemize, leading to rapid growth in interest and consumption in 2017. 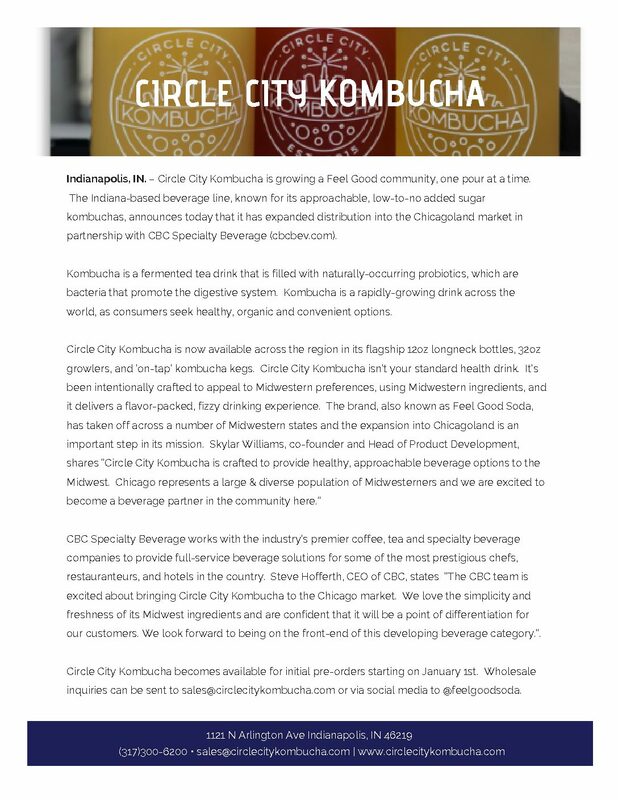 Their mission of creating a healthy alternative to soda began to set and Hoosier’s all over be began to crave Circle City Kombucha (CCK). Circle City Kombucha has 3 year round flavors: Peach Blossom, Ginger Lemon, and Pomegranate. Personally my favorite flavor is ginger lemon but being a natural ginger I gravitate towards that flavor! In addition to these, they have a few seasonal rotating flavors. The current one’s being Pineapple Mint and Strawberry Rhubarb.